It’s hard to believe that we have reached December, Advent and a new liturgical year. I was amazed when I walked into the Dollar Store in late October to get those last minute parts of my Halloween costume to see the Christmas section already up and dwarfing the Halloween section. Advent is supposed to be a time of quiet, joyful preparation for the celebration of Jesus’ birth. We can get lost in all the hustle, bustle, and commercialization of the Christmas season, and are so busy preparing our homes and ourselves that we forget to prepare our hearts for the coming of Jesus Christ. For all of the Christmas cheer and joyful celebrations, this time of the year can also be one of the loneliest. What if you do not have any family or friends around? What if you cannot afford even the tiniest gift? What if you do not have a home? We can prepare our hearts by following Jesus’ commandment to Love one another as I have loved you (John 13:34). We can show our love to others through Sharing our Bounty. This Advent season at OLA we are going to be witnesses to our faith through serving others by sharing our time, treasure and talents in a variety of ways. Staff is supporting Catholic Central’s Santa’s Anonymous program by donating toys for the families. Each week our students will be sharing their time and talent at our Advent celebrations. Please come join in our celebrations which take place the first day of the week at 9:00 am. We are also asking students to Share their Bounty this advent season by following the example of Ella Tyron and giving comfort to others. When Ella was hospitalized in 2016 she turned to one of her favorite activities: coloring. She discovered that the hospital could not maintain a supply of crayons and coloring books due to cross-contamination concerns. With the help of her mom, Ella started the Help Color Me a Rainbow project and has solicited donations and has donated thousands of crayons and hundreds of coloring books to hospitals. We are asking students to give comfort to others by creating Christmas cards for their family, neighbors and the elderly. Some of our cards will be going to Streets Alive Mission, our school neighbors and the elderly in homes. Another way to witness and Share your Bounty is through our Sock Drive campaign that will run from November 28 – December 14. We are collecting socks that will go to support the following local charities: Harbour House, Salvation Army, Homeless Shelter and Woods Homes. I was amazed at the generosity of the school community for our Drive Away Hunger campaign and believe there are going to be similar results as on the kick off day, the students had already brought in over 200 hundred pairs of socks. At our Christmas Family Fun Night on the 13th from 6:00 – 7:30 pm. we will be having a Cake Walk. People will have a chance to play a musical chairs type game and each round, someone will win a cake. An entry for a round will cost 25 cents and all the money collected will go towards our Sock campaign. In order to make this game possible we would appreciate any cake donations that you could make for this event. You can send your cake to school on the 13th or bring it with you for the evening event. If you’ve never experienced a Cake Walk, make sure to pop into the gym as it is one of my favorite, fun events. If I don’t see you at one of our activities this month, I would like to wish you and your family a Merry Christmas. As adults we are always taking care of others and can ignore taking care of ourselves. In reality, we are better equipped to help others when we have taken the time to help ourselves. We can take our health for granted until we do not have it anymore. This is found out as I suffered from vestibular neuritis for the past couple of weeks and was dependent on others to drive me around. It is a viral infection of the inner ear which inflames the nerve and affects balance and concentration. Being sick forced me to slow down, take care of myself, and allow others to take care of me. It is a little ironic though as my professional development for the past month focused on wellness. One of our school’s Health and Wellness goals is to reduce the incidence of student anxiety. We are trying to promote learning by ensuring that students are emotionally regulated and that their brains are ready to learn. One of our student nursing teams worked with Tracy Rocca our FSLC to develop resources for both home and school. They presented their website to the parent council and to staff. Please take a look at it under the Resources and Publication/Counselling/Student Wellness Website section of our website. The site has many resources for parents on Understanding Emotions, Self Awareness and Social Awareness. In a similar vein, a school team attended training for the Mind Up program on November 8th. This is a research based program that teaches activities around topics such as gratitude and mindfulness. The four pillars of the program are neuroscience, positive psychology, mindful awareness and social-emotional learning. Students are taught about how their brain works and what is happening that allows them to learn and what can stop them from learning. It goes along well with our zones of regulation that we have already been implementing as it gives us a practice to help students calm their brains from coming in after running around at recess time so they are ready to learn. A few teachers are incorporating some of the program’s practices into their classrooms and we tried out the core breathing exercise with staff. Another goal for the school is to continue to promote and build student leadership for comprehensive school health. We started a new option class this year: Health and Wellness Leadership. The students in this option class created a website with activities covering the following four areas of wellness: mental, nutritional, physical and spiritual. When you click on FLVT Health and Wellness under the Resources and Publications tab, you are taken directly to the site. Students also organized different wellness activities throughout the first quarter. The wellness team is also continuing with Red Light, Green Light, Eat Right program that promotes healthy eating. Students can bring in a healthy yellow food in December and complete the form in the canteen for a chance to win a prize. The next project for the team is the development of school garden boxes in the new year and possibly a school wide wellness day. As astaff, we had a wellness retreat day last Friday so that we are better equipped to handle the challenges of the coming month. We started the day focusing on Spiritual Wellness with Taizé prayer led by Peggy from L’Arche Lethbridge. Taizé is short, chanting prayers that were sung and repeated many times with scripture readings, psalms, intercessions and a ten-minute silence in the middle of the service. It was a beautiful service that was calming in its simplicity. Next staff participated in a variety of wellness activities ranging from going for a workout to creating crafts to playing card games to listening to music and, above all, building community by visiting with one another. We closed the day off with the fellowship of a beautiful meal. It was a relaxing day as we prepare for the business of the coming Advent season. At the Inter-Jurisdictional Health Champion Wellness Day on November 29, I learned about Intellectual Wellness. Social connections are one way to support good brain health and wellness so I invite you to join us for our various activities this month. Music is another great way to support brain health so you could come out to one of our musical events. Our elementary choir will be singing at December 6 at City Hall from 12:00 – 12:30, and the grade 2 and 3 classes will be singing at the Evening of Christmas as St. Basil’s Church on December 19 at 7:00 pm. Our Christmas Family Fun Night will be at the school this year on the 14th from 5:30 – 7:30. It is a wonderful event filled with many activities to promote brain health, such as, coloring, story telling, cake walk, cookie decorating and an obstacle course. Help boost your Spiritual Wellness by joining us for a Monday Advent Celebration. Finally, we invite you to come into the school on the last day of December as the staff serves hot chocolate and candy canes to parents and students. It has become one of my favorite traditions here at the school. If I don’t see you at one of our events this month, I wish you and your family a Merry Christmas. In response to feedback from students, teachers, and the community, programs were put in place at Father Leonard Van Tighem to engage students in their interests and passions, as well as foster community connections. In quarter one grade eight and nine students saw their physical education course offered with a new structure and focus. Students got to choose whether they wanted to engage in a competitive physical pursuits style course or were more suited for a lifestyle fitness approach. The intensity of the delivery of the programs was the biggest difference as students used their 90 minutes of class time being active, fostering lifelong fitness habits while experiencing community facilities and organized activities. Students frequently biked to the different venues, exploring activities such as swimming, racquetball, golf, wall climbing and scuba diving; activities that weren’t defined by traditional school gym space. Teacher Mario Pasquotti says “the course was a success, the kids were excited, engaged, and made lifelong connections with activities and individuals in the community.” For the remainder of the year students decide how they would like to stay active with courses such as fitness, yoga, golf, dance, and track and field to name a few. 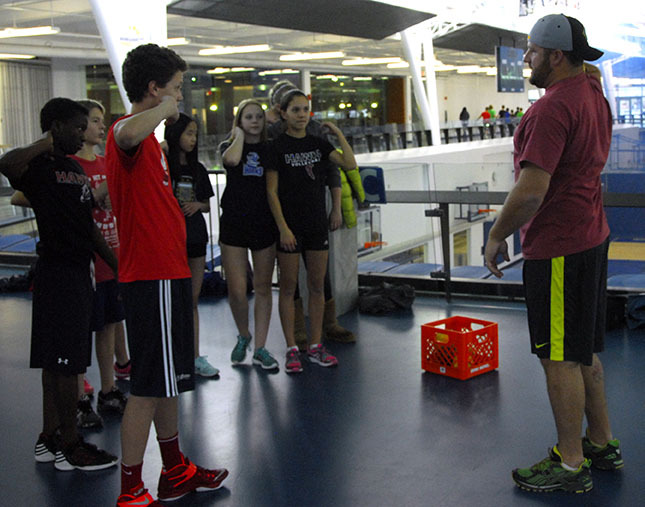 When the track and field course wraps up, a Dance Basics class begins. Miss Joy and Miss Aurielle from Joy’s Dance Factory will be leading the charge. Miss Joy and Miss Aurielle are both registered teachers with The Royal Academy of Dance and accredited ADAPT teachers. These ladies are more than shiny credentials, their extensive experiences and awards speak to their abilities and knowledge of tap, jazz, musical theatre, preschool movement, and ballet. FLVT also offers a Dance Elite course for students training for festival or seeking additional private lessons. This course is geared towards experienced dancers who would like to commit more time in their week to their dance career. Each class is about meeting students where they are and supporting their passions and being exposed to world class instruction and expertise. It’s hard to believe that we have reached December, Advent, and a new liturgical year. December is a short month that is packed full of activities. We can get caught up in the craziness and commercialism that is Christmas. It always amazes me to walk into stores on November 1 and see the Christmas section going up as the Halloween section is being taken down. Advent is supposed to be a time of quiet, joyful preparation for the celebration of Jesus’ birth. As I am writing this, I am looking forward to starting my preparations by attending the Women’s Advent Retreat at St. Martha’s Church this weekend. This is my third year attending and am looking forward to the fellowship of women from Lethbridge and surrounding areas, the fabulous food, and time to experience and reflect on the theme: Spending TIME with Jesus. If you have not attended the retreat before, I invite you to think about attending next year. As for the school preparations, we are going to be celebrating the theme of Walking Together through Advent. Each weekly celebration will focus on Hope, Peace, or Love. We are working on a social justice program to raise awareness about cancer and to support cancer research through donations. Students are able to donate at the weekly advent celebration. Our grade 9 students are doing morning prayer during Advent and will be creating prayers that reflect our theme. When you are in the gathering space look for the bulletin board display that will be put together that will illustrate how we are Walking Together through Advent. We are going to be adding to this bulletin board throughout the year. We have a couple of special events going on in December that I hope to see you at so please mark them down in your calendars. Our school celebration this year is Christmas at the Fort. It is on December 11 and runs from 5:30 – 7:30. This event is for the entire school and includes activities, such as, cookie decorating, making snowflakes, going on hay rides, learning about First Nations culture, caroling by the fire, and enjoying a cup of hot cocoa. The next school event takes place on Sunday December 14 at 4:00. We are working with the Hurricanes to have a School Rocks Night. There are 14 other schools in Lethbridge participating and we are hoping to sell as many tickets as possible so we can fill a section full of red and black Hawkwear. This event is not only build community but also acts as a fundraiser for us as we receive money from the Hurricanes for every ticket sold. Money raised from this will go to meet our fundraiser target for school activities and clubs. Finally, we invite you to come into the school on the last day as the staff serves hot chocolate and candy canes to parents and students. It has become one of my favorite traditions here at the school.